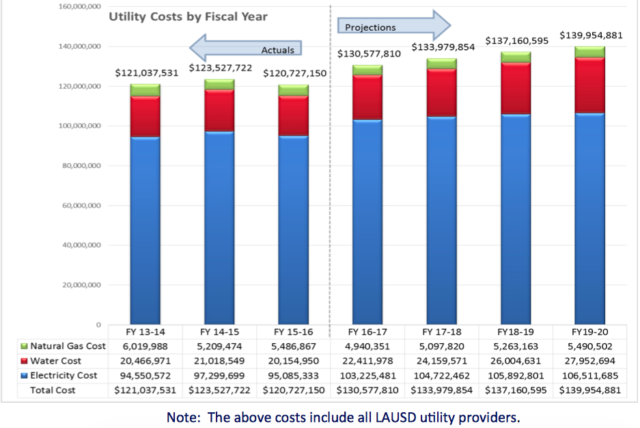 Last year LA Unified board members were shocked to learn that higher utility rates could jack up the district’s utility bill by $24 million. So they swung into action with energy-saving measures. But on Tuesday they learned they could be facing even steeper increases — up to 50 percent more. Even with a 13 percent reduction in water consumption since 2014, the Budget, Facilities and Audit Committee was told Tuesday that the district’s utility bill could jump as much as $36 million over four years. In a report presented Tuesday morning, Christos Chrysiliou, the district’s director of Architectural and Engineering Services, described ways the district is trying to save on utility costs in order to keep the increase to about $10 million. But even $10 million more would be hard to find, he was told. The Los Angeles City Council approved the LA Department of Water and Power increases last March. Ratliff pointed out that declining enrollment and a looming budget deficit make the utility increase a potential disaster. Former board member Bennett Kayser had called on DWP to give the district a discount, and in 2008, the DWP was ordered to pay back the district $67.7 million in cost overcharges. Last year, Ratliff passed a resolution asking the district to discuss the rate hike impact with city and utility officials. That was when the increase was estimated at $22.4 million, an amount that could fund 211 classroom teachers or 364 building and grounds workers, Ratliff said. “I appreciate you being honest with us,” Ratliff said to Chrysiliou, who tried to explain the district’s cost-saving measures. In the 2015-16 school year, the district saved $3 million in utility costs by fixing pipes, adding solar energy and taking other measures, he said. 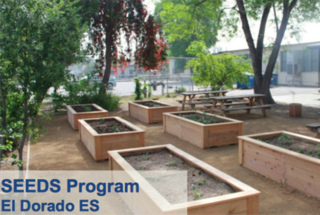 The DWP gave the district $3 million to help schools capture more groundwater to use for gardens, and it helped with an education program to conserve, Chrysiliou said. An additional $2.7 million was saved by reducing water consumption 13 percent through plumbing fixture upgrades. 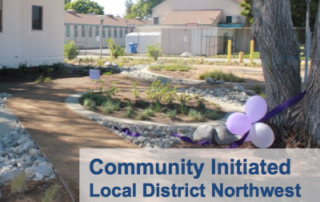 LA Unified Chief Facilities Executive Mark Hovatter said the district continues to replace lighting fixtures and get rid of bungalows to help energy costs. 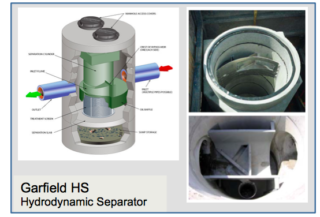 Chrysiliou said 140 schools have storm water devices and 20 more are in planning stages. They have completed 42 school projects that collect ground water and recycle the water for gardens. “We are expanding the program and figuring out how to go through all our schools,” Chrysiliou said. Hovatter pointed out that collecting the water from the recent rains will help restore school playgrounds and gardens.